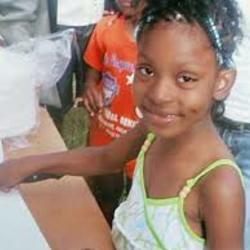 Aiyana Mo'nay Stanley-Jones (PDF), slept on the couch as her grandmother watched television. Outside, Television was watching them. A half-dozen masked officers of the Special Response Team—Detroit's version of SWAT—were at the door, guns drawn. In tow was an A&E crew filming an episode of The First 48, its true-crime program. The conceit of the show is that homicide detectives have 48 hours to crack a murder case before the trail goes cold. Thirty-four hours earlier, Je'Rean Blake Nobles, 17, had been shot outside a liquor store on nearby Mack Avenue; an informant had ID'd a man named Chauncey Owens as the shooter and provided this address. The SWAT team tried the steel door to the building. It was unlocked. They threw a flash-bang grenade through the window of the lower unit and kicked open its wooden door, which was also unlocked. The grenade landed so close to Aiyana that it burned her blanket. Officer Joseph Weekley, the lead commando—who'd been featured before on another A&E show, Detroit SWAT—burst into the house. His weapon fired a single shot, the bullet striking Aiyana in the head and exiting her neck. It all happened in a matter of seconds. The raid was being filmed by camera crews for the cable-TV show "The First 48." according to Detroit News. This was a reality TV show which regularly featured Officer Weekley. As of April 2, 2015, Officer Weekley was back on duty. In September 2018, the Michigan Supreme Court cleared the way for a trial or settlement in a lawsuit against a the officer in this case. Two courts had previously said a jury could decide whether Joseph Weekley's actions amounted to gross negligence. The Supreme Court this week declined to hear an appeal. The trial regarding the tragic death of 7-year-old Aiyana Stanley-Jones is scheduled to begin on April 8, 2019 in the Wayne County Circuit Court, before of the Honorable Craig S. Strong. On Thursday, April 5, 2019, the city of Detroit reached an $8.25 million settlement with the Stanley family. May 2016 Justice hasn’t been served for Aiyana and her grieving family. We’re planning a peaceful rally in front of the Coleman A. Young Municipal Center on May 21 to honor the memory of Aiyana and other victims of police violence and demand demilitarization of police. We should draw as much attention as possible to the lack of justice for the families of those who lost their beloved ones at the hands of the police.